The reverse osmosis hall of the seawater desalination plant on Tortola in the British Virgin Islands. Following commissioning and acceptance testing of Biwater’s 10,400m3/day award-winning seawater desalination plant on Tortola in the British Virgin Islands, residents and businesses have welcomed a 24 hour drinking water supply reaching all corners of the island nation. When the plant began operating last month, the general public confirmed both a good pressure and quality of water reaching them continuously, vastly improving their access to drinking water. Sabbath Hill, being one of the highest points on Tortola, is ideally located to be able to gravitate potable water from water storage tanks directly into the extensive distribution system. As part of Biwater’s scope of work, the company refurbished an existing 500,000 gallon storage tank and constructed a new tank of similar size, doubling storage capacity and enabling water distribution to extend to areas of the island that had never received a permanent piped supply before. This island-wide improvement scheme helps to meet Tortola’s water treatment capacity requirements inline with the Government’s long-term water and sewage master plan. In addition to benefiting local residents and businesses, the new plant supports the Government in meeting the growing demand of its tourist industry, which will see larger cruise ships dock on the island once phase one of the new ‘Cruise Pier Project’ is complete in 2015. This will allow the Government to supply water to vessels that dock in Tortola to replenish their water storage levels, whilst visitors spend time exploring the British Virgin Islands by land and sea on popular day trips. “The completion of this new seawater desalination plant is a key milestone for the British Virgin Islands, as it will greatly benefit the local community for generations to come by providing a reliable supply of drinking water year-round. It is also a great accomplishment for Biwater and the local contractors who helped to deliver this state-of-the-art seawater reverse osmosis plant,” said Richard Smith, Director for the Americas, Biwater International Limited. 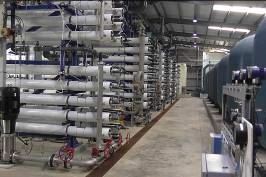 Following the commissioning of this seawater reverse osmosis plant, Biwater will continue to operate and maintain the facility over a 16 year period as a part of its obligations under its Water Purchase Agreement, Build Own Operate Transfer (BOOT) contract with the Government of the Virgin Islands. In 2015, Biwater is also due to complete two package wastewater treatment plants, ‘BiCOMs’, which will provide a quick and scalable wastewater solution for Tortola. The project has benefited from successful project finance package, which saw Biwater inject equity into the project at an early stage to get works underway, and a latter USD 43 million deal with Barclays in 2013. The deal included a 100% guarantee from ECGD, the UK’s Export Credit Agency. At the 2014 Global Water Awards, the project was recognised by Global Water Intelligence, saying it demonstrated ‘inspired financing for an inspired contract’ under the Desalination Deal of the Year Award category. The 10,400 m3/day system is a two pass system, running at 45% recovery. It incorporates four first pass trains and two second pass trains and is designed to run at 100% capacity. Pre-treatment consists of two stage media filtration, followed by five micron cartridge filtration, to protect the system from foulants. Biwater is utilising energy recovery – incorporating pressure exchangers with booster pumps to the reject line – to complement the high pressure pumps feed supply to the first stage reverse osmosis trains. Treated water mains total 3,330 m, along steep terrain, with a total rise of 393 metres, including two treated water pumping stations. The craft beer, which has been created from reused water, will be served in Long Beach, California.